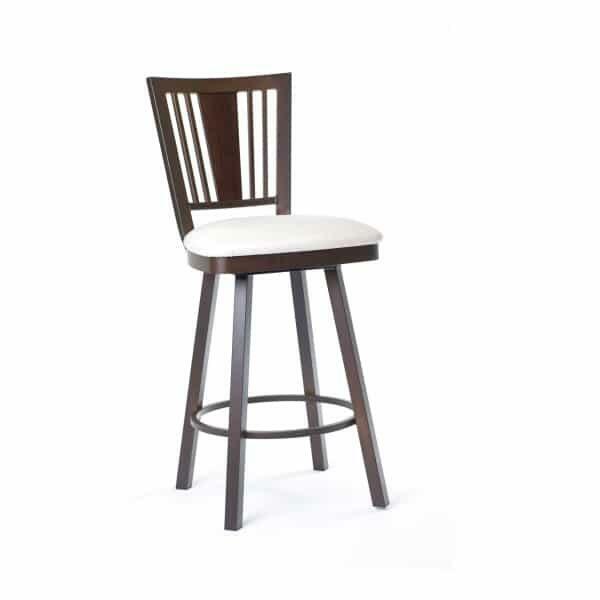 The Madison Extra Tall Bar Stool stands at the unique 34’’ seat height, and is commonly known as a spectator chair. Extra tall bar stools fill the bill in unique spaces that are too tall for a regular bar stool. Spectator chairs are ideal for use next to a pool table or other activity space, or to slide beneath an extra tall custom bar top. The Madison Extra Tall Bar Stool is ideal for sliding underneath a countertop to save space, as it has no armrests. But, Amisco keeps an eye on comfort by providing a tall seatback that is fashioned with wood, a plush cushion, a 360-degree swivel and a full footrest. The Madison stool is made with a steel frame and a fabric cushion cover. Both of these are up for customization, and Amisco provides a lengthy list of options for both. Choose an elegant combination, as pictured here, or go for more zany, metallic and patterned options. Amisco encourages you to make the Madison Extra Tall Bar Stool one-of-a-kind.